We often forget how big we are compared to our feline friends. When an adult comes whooshing in, arms outstretched, preparing to either scoop the cat up or pet it, the response most often is fear. Usually the cat is gone in a nano-second. Unfortunately, this can become problematic and sometimes results in a compromised relationship with your cat and a loss of trust. You can avoid this by using some tried-and-true methods when approaching a cat – whether it's yours or one that you're meeting for the first time. The decision of whether or not to get acquainted is up to the cat. You can slowly reach toward the cat, but let her decide whether or not to get to know you. If she rubs against your legs, you'll know you've been accepted. She's spreading her scent, while building her own comfort level. Or, if she smells your hand, she's trying to determine if you're safe or not. She and you are establishing trust in each other. If a cat is especially skittish, be patient and take your time. Let the cat come to you first. Ignore it, avoid eye contact and don't reach toward her. 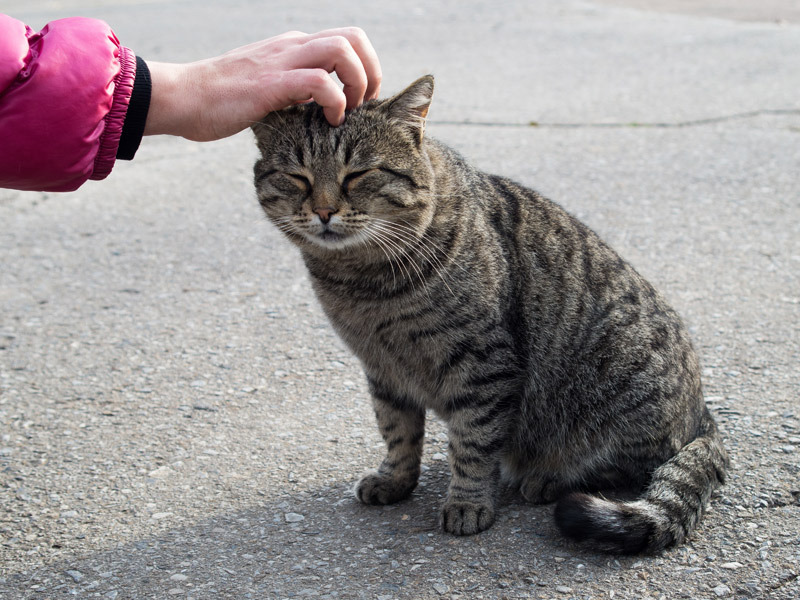 Once she feels comfortable, she'll signal that it's okay to pet her by moving toward you or rubbing against your leg. The position of your body can help the situation. Turn to the side rather than facing a cat directly. Avoid eye contact. Make yourself smaller by sitting or kneeling. Many cats are better at getting acquainted if they are on higher places, like on a couch or perch. If the cat decides to investigate, you then can slowly extend your hand for the cat to smell. A slow blink shows you are friendly and safe. Close your eyes, count to three, and open them. This indicates that you are safe. If the cat returns the slow blink, you'll know that you've been complimented. Treats and toys provide extra encouragement. Since cats are such foodies, they usually find it hard not to be impressed by treats dropped nearby or safe cat toys (preferably no plastic) such as peacock feathers.